Pieni Sammakko: Tästä se alkaa! And so it begins! Ihana lämmin kesä on jarrutellut uuden talon tekoa, mutta tästä se lähtee! Sammakkoperhe Wirkkula odottaa jo innolla uutta kotiaan. Talon lähtökohtana on kolme Alkosta saatua puista viinilaatikkoa. Korkeus: 25cm, Leveys 30cm ja syvyys 17cm. Ideani tarvitsevat vähän lisää tilaa joka kerrokseen. :) Sitä täytyy tuumia ja suunnitella! Laatikoissa on liukukannet, minkä avulla talon voi sitten tarvittaessa sulkea. Lovely warm summer has made me slow in starting to make the new dollhouse, but here it goes! The Frog family, the Wirkkula's, are already looking forward to their new home. The house is based on three wooden wine boxes from Alko. Height: 25cm, width 30cm and depth of 17cm. My ideas will need a little more space on each floor. :) So, more thinking and planning! The drawers have sliding lids, so if needed I can close the house. What a great idea to use these wine boxes! And of course you'll always be able to add another one - if the family grows. Lucky Wikkulas, they will get the most wonderful froggie home ever! 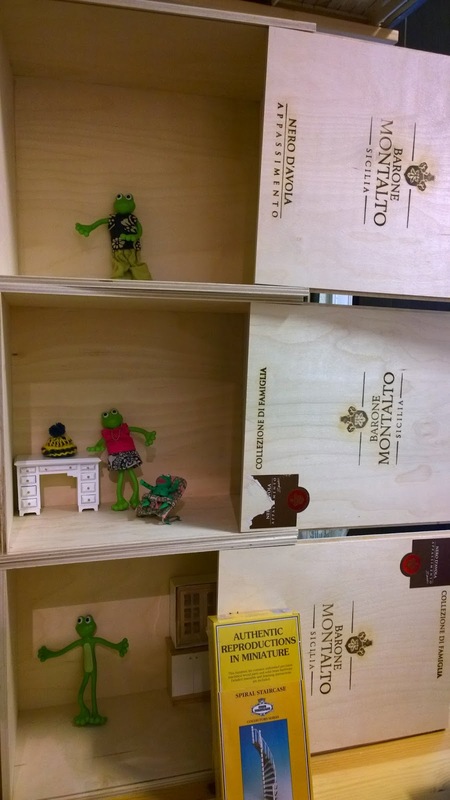 Well I can't wait to see the results of the new frog home, great idea using wine boxes. Your trip to Germany and photos look beautiful. Very clever using those wine boxes! I love it. I'm looking forward to seeing more, Kikka. Great idea. You can change, if you want to, the wooden sliding lids to glass lids. These will keep out the dust and will enable to show your display permanently. It must have been terrible, having to drink all that wine so you could make a new house!! ☺ Clever idea! Perfect for size, sturdy and easy to store. I see the frog family are already figuring out what they want to do with their new place! En voi odottaa nähdä sammakko talon edistymistä. Se on erittäin mukava kokoinen koti. Wonderful idea using the wine boxes as a house. I am looking forward to seeing what you do with them. Kiva talo tulossa sammakoille! Laitoin sinulle joulukalenteriin luukut 12b ja 22b. Ja Leenalle pyytämänsä luukut. Mukavaa syksyä! The boxes looks perfect for a house, I like how you can close it, it wont attract that mush dust that way... =) I'm looking forward on what you will make of this! Hauska projekti. Pistän muistijäljen mieleeni. Täytyy seurailla. Nuo viinilaatikot ovat mainiota tarviketta.